I flew to California in the LongEZ twice last month. I’ll write up the experiences in two separate blog entries. 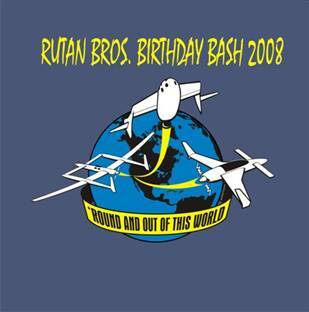 The first trip was to attend a birthday bash in Mojave, CA for the Rutan brothers. This was a huge event with more than 500 attendees. I had seen pictures of the last birthday celebration event that took place in 2003 and thought that if they were ever to do that again, I must try to get out there. A few weeks ago I received an announcement through one of my canard mailing lists that a big birthday bash was planned for Saturday, June 21st, 2008 and mentioned it to Terri. “You should go!”, she told me, so that I could participate in this historic event. That’s all the encouragement it took. Soon I was planning the trip and looking forward to flying there. I had some other things that I wanted to do and see in California, including a business meeting with a potential client at Van Nuys airport just north of LA. I also wanted to visit my friends Marc and Deanie Zeitlin, who live in Tehachapi a few miles from Mojave. Marc and I met in 1996 after he had started the Cozy mailing list which has been going on every since. He and Deanie have been out to visit us a few times and we usually see each other at Oshkosh each year. Marc moved from Massachusetts to California when he went to work for Burt Rutan at Scaled Composites about 3 years ago and has been busy working on the SpaceShip 2 design. He and Deanie just completed building their dream home in Tehachapi and so I was eager to visit and see it firsthand, after reading his report on his website about the design and construction of the house. Seeing it up close and staying with them for the weekend gave me a whole new appreciation for this beautiful home with its fabulous view and many unique features. I launched on the morning of June 20th about 7:45 a.m.. My friends Curt and Gail were also flying their Varieze to the gathering and planning on stopping in Grand Junction, CO for their first fuel stop after climbing over the Rocky Mountains. I figured I’d be able to raise them on the air-to-air frequency and hopefully catch up to them in St. George, Utah for lunch. Shortly after takeoff, I heard a familiar voice on the frequency of Rob Martinson who flies a Varieze out of Denver. He was also planning to stop in St. Geroge for lunch so it was comforting to have some company that I could chat with on the radio enroute. Rob just won the prize for the most efficient airplane at a new contest called FuelVenture where he managed to get 66 mpg from his Varieze while flying along at 137 mph. I cleared the Continental Divide just to the south of Long’s Peak at an altitude of 12,500′ and stayed at that altitude for the majority of the trip across Colorado and Utah. Rob took a more circuitous route so he could fly over Lake Powell in southern Utah. By the time we got near Moab, Utah I found Curt on the frequency as he and Gail had just taken off from Grand Junction after their first fuel stop. I should mention here that the LongEZ carries twice the fuel load of a Varieze and could easily make it to California with no fuel stops, but I generally only fill the tanks half way to give me better climb performance and because I like to land and take a break every 3 to 4 hours. I’ve only rarely taken advantage of the full 52 gallon fuel capacity which gives the LongEZ a 1150 mile range. The scenery across Colorado and Utah was beautiful and I’ve linked a few photos below. We touched down in St. George, Utah around lunch time and Rob, Curt, Gail and I all walked over to a restaurant at the north end of the field for lunch. There were already 4 other canard planes on the ramp that had arrived about an hour before we did and they were fueling up and getting ready to leave. Everyone at the airport was curious how so many canards had landed at the same time. I generally run into at least one person at each fuel stop who has never seen a canard aircraft, despite the fact that more than 2000 of them are flying today. So having 7 come in at once to a remote location like St. George is a very rare sight. After eating lunch and refueling, we headed out again. Rob and Curt were going to go directly to Mojave, but I was heading to Van Nuys. However, we needed to take the same route to get around the restricted airspace near Edwards Air Force base in Mojave. We flew directly over the top of the Las Vegas airspace at 10,500′ which gave us spectacular views of the entire city. Nevada is exceptionally dry with hardly any vegetation from one end of it to the other, as is western California where it borders on Nevada. It’s a very stark landscape to see from the air. At 10,500′, the air was cool and a little bumpy. The flight went quickly and in a few hours I bid my goodbyes to Rob and Curt and headed into the busy airspace over southern California. There was a heat wave in progress and when I landed at Van Nuys and the temperature was 43C on the ramp (109F) and it felt unbelievably hot. Even a stiff breeze didn’t seem to help, except to make me feel very parched and in need of some lemonade. I met with my client at the Airtel Plaza Hotel restaurant and discussed a project over dinner. After we finished up, I picked up a little more fuel and headed up north to Tehachapi. In just over 30 minutes from the time I took off, I was threading my way through the mountain passes that had hundreds of wind turbines of all sizes. The wind through Tehachapi pass is some the most consistent and steady wind you’ll find in the U.S.. Marc tells me that it’s rare to see the wind turbines standing still. I had a very enjoyable evening with my friends Marc and Deanie and caught up with what had been happening with them since the last time we met. The new house exceeded all of my high expectations of it. It has numerous features that would fit right in at Architectural Digest. It has gorgeous views in every direction and I stitched together a view from the deck that seemed to go on forever which you can see below. Perched up on a slope, it has a consistent breeze that cools down at night so that the air conditioning was hardly needed despite the heat wave going on all around us in southern California. The spectacular view from Marc and Deanie’s deck. Click on image to get the full view. nd fliers and I got to see a lot of folks who I run into each summer at Oshkosh. One lucky guy and 4 of his friends won a 30-minute ride in a Rutan-designed Beech Starship, which was parked on the ramp. I also got to go in it and take a look around its interior which was very spacious. At the party, we were joined by Bill and Marilyn Seibold, who had flown their Cozy from Bisbee, AZ that morning. They also stayed with the Zeitlin’s that evening. It’s always fun to be immersed in a group of fellow aviation enthusiasts. I never grow tired of talking about airplanes and the adventures we have in them. After a nice dinner, I went to sleep, knowing that I would to wake up early the next day without rousing the other guests or my hosts so that I could have the maximum amount of smooth morning air for flying across the desert. Marc let me borrow his car for the drive to the airport and so I left the house around 6:20 a.m.. By 6:50 a.m., I was in the air and on my way to my first fuel stop in St. George, Utah. I had hoped to get fuel at the self-serve pump at Tehachapi, but it was out of service. After doing some calculations, I figured I’d still be able to get to St. George with a reasonable reserve. Upon landing at St. George, I ran into Curt and Gail again, who had just finished fueling their Varieze. We took off at about the same time and flew together for a while. They only had about 2.5 hours of fuel, so they’d need to stop before getting home to Longmont, CO, but we weren’t sure of our route because we knew that there would be thunderstorms over the Rockies by the time we reached them, which may have required us to divert north or south of a direct route. They decided to stop in Grand Junction and I pressed on figuring I’d land at an alternate airport if the thunderstorms grew too dense to fly around. Fortunately, the thunderstorm coverage was only about 50%, leaving a lot of room to fly around them, although it was a bit bumpy as a result of the convective activity and virga nearby. I have some pictures linked below and the last 4 photos show the various thunderstorms in the area as I was crossing the Rocky Mountains. After looking at the radar picture on the ground at Grand Junction, Curt and Gail decided to spend the night there. I couldn’t blame them since the storms are not predictable and what looks passable one hour may grow in intensity the next hour. Had I seen the radar picture, it might have been enough to convince me to wait for the clear and smooth morning air to pass over the Rockies. It was a great trip. I’ve never had the LongEZ over that part of the country and found the experience to be a wonderful way to take in lots of beautiful scenery in a very short time. The entire flight time to and from California was just over 6 hours each way. If I had driven the route instead, it would have been more than 1100 miles and would have taken 16 hours of driving each way and used twice as much fuel. It was a good warm up for the follow-up trip that I took a few days later to San Diego, CA with Terri. I’ll write up that trip later. If you’d like to see some photos I took on the trip, you can find them here. Update 2008-07-09: Chris, who was flying as part of the 4-canard flight out of Colorado Springs, posted some more great pictures including air-to-air shots on the way to and from the Birthday Bash.